In his program notes for this recital, Jens Korndörfer wrote, "Today's program is designed to showcase the many different colors of the beautiful Baroque-style instrument (the 1976 Flentrop organ) in Duke University Chapel." It did just that, in music by German, French, and Dutch composers from the 16th through the 18th centuries. This was music made by a master musician with a superb command of musical styles, firmly-rhythmic drive, and intimate knowledge of organ registrations appropriate to the music being performed. Korndörfer didn't play to show off his technique (although his is clearly equal to any challenge), but rather to make the audience aware of the organ's tonal capabilities. Since Duke Chapel did not choose to introduce the hidden-amidst-the-organ guest performer, it's fortunate that the opening Toccata VII by Georg Muffat (1653-1704) began fortissimo, quieting the audience's conversations quickly. While neither Georg nor his son Gottlieb Muffat are well-known to today's listeners, both were important composers in their time, and Georg's writings have been of immense importance to musicologists in their studies of Baroque performance practices. The organ toccata of this period was not a flashy, perpetual-motion piece, but rather a multi-movement work in varied dynamics and tempi. In the six sections of Toccata VII, Korndörfer highlighted the organ's reeds, flutes, Principal Choruses of the main and secondary divisions, a fugue using the Cromorne and Cornet voices, and the organ's plenum ("full organ") sound. French music followed: two works by Louis-Claude Daquin (1694-1772). That church-going French people love their Christmas carols is evident not only by the sheer number of Noëls, but by the practice of 18th-century (and later) organist-composers of writing extended variations on them. Korndörfer played two of these from Daquin's collection entitled Nouveau livre de Noëls ("New Book of Carols"), composed when he was organist of the Royal Chapel. In the first, "Noël sur les Flûtes," Korndörfer followed the composer's direction to play "very tenderly," as he chose the perfect tempo in utilizing the organ's liquescent flute stops (it has more than a dozen). The trumpets and other reed stops were then heard in the "Noël Suisse," its dotted rhythms contrasting wonderfully with the smoothness of the preceding work. In both, Korndörfer's articulation was perfectly suited to the Chapel's reverberant acoustic: every line was clean and clear. Well-known works continued the recital, as we heard the best-known of Jan Pieterszoon Sweelinck's (1562-1621) organ works, his six variations on Mein junges Leben hat ein End ("My young life is ending"). Again, superb articulation made the frequent passages of parallel-thirds and parallel-sixths sing beautifully. Next came one of the program's two major works, J.S. Bach's Toccata and Fugue in F, S.540. The Toccata, famous for its two extended pedal solos, was not only note-perfect (and this IS one of those perpetual-motion toccatas for which a performer would wish to be paid by the note! ), but played with a rock-solid rhythmic drive. Fortunately, Korndörfer also played the Fugue, so often left unplayed because, unlike the toccata, it's not flashy. It's actually a double fugue, its two subjects so unlike that only a master craftsman such as Bach could combine them so that they work together. The first serenely-chromatic theme and its exposition (during which the pedal reed overbalanced the manuals) were appropriately legato, while the second theme was, by its very nature, more dance-like. When Bach included ornamentation in a fugal theme, he wrote that ornamentation (usually a trill or mordent) only in the first two or three times the theme occurs, assuming that the performer would understand that it should continue to be used in later occurrences. While some organists seem unaware of this, playing only what's written, Korndörfer included the first theme's trill each time except for the final statement of the tune in the pedal. Both Robert and Clara Schumann took great pleasure in playing and learning from Bach's music, especially his fugues. In the midst of what he called his period of "fugal passion," Schumann wrote six fugues using Bach's name as their chief theme. (In German musical notation, B-flat is called "B," while B-natural is called "H": therefore, B-flat/A/C/B-natural = BACH.) Bach himself was, of course, aware of this and used it, perhaps most famously in the unfinished concluding fugue of his Art of Fugue cycle. In the toccata (in F) which we had just heard, the B-A-C-H theme is heard twice, albeit in transposition, in the bass line where the ear is alerted by a deceptive cadence! Intended for organ or pedal piano, Schumann's fugues combine traditional Baroque counterpoint with modern Romantic harmonies. In offering the third of Schumann's six B-A-C-H fugues, Korndörfer again realized the composer's intentions to use the "softest stops," sweetening their sound further by using one of the organ's tremulants. The recital's final work was the great "Introduction and Passacaglia" from the Sonata No.8 in E minor, Op. 132, by the unjustly-neglected composer Josef Rheinberger (1839-1901). Like Schumann and Max Reger, Rheinberger's music blended older forms with newer harmonic language. Korndörfer played the Sonata's opening adagio page to introduce the massive Passacaglia which, after some twenty-five variations, returns to that opening page's theme to conclude the work. Rheinberger weaves his passacaglia theme not only in its traditional place in the organ's pedal line, but also into the soprano, alto, and tenor voices. Korndörfer's masterful playing, using the organ's full sound palette, showed that this Romantic-era work is easily part of the Flentrop's tonal language. Responding to the audience's applause, Korndörfer offered a moving performance of the Elevation/Tierce en Taille from François Couperin's 1690 "Mass for the Convents." 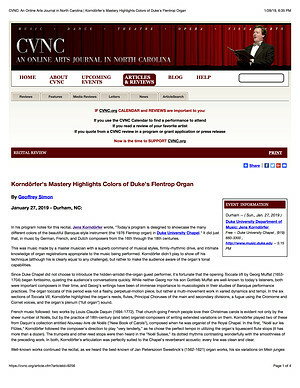 One hopes that Duke will bring Korndörfer back to play the Chapel's Aeolian organ, so that audiences may hear this artist (who recently performed Joseph Jongen's 1926 Symphonie Concertante, one of the great organ show-stoppers of all time, in Atlanta) in repertoire which shows his performing eclecticism. It would be good (and well within the Chapel's present capabilities) to allow audiences to see recital organists play, as well as hear them. If this bow to the 21st century is good enough for Notre Dame Cathedral in Paris as well as St. Stephen's Episcopal Church in Durham, NC (which boasts another magnificent Flentrop organ), it should also be good enough for Duke Chapel!